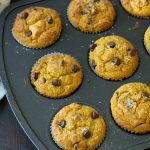 A gluten free cheddar muffin recipe that’s easy to make, and the light and fluffy muffins are SO delicious! To see how to make the gluten free savoury muffins recipe, watch our RECIPE VIDEO! Learning how to eat gluten free has never been so easy! 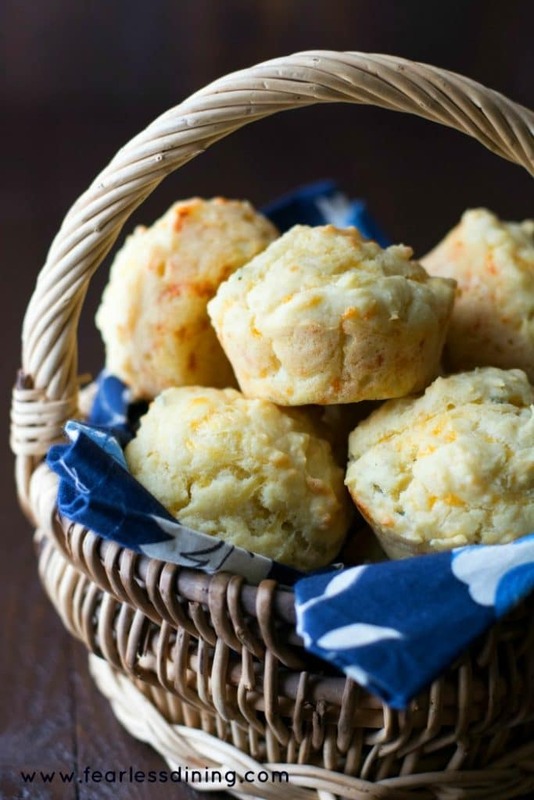 Watch how easy it is to make these gluten free savoury muffins. I made a YouTube video to help you make these on your own! Hopefully, I will get braver and better as I continue to make tutorials for you :-). The short answer is yes, cheese is gluten free….BUT, you ALWAYS want to read the labels. Highly processed cheeses (think Cheeze Whiz types of cheese) may contain gluten. Don’t you wish you could reach through the screen and grab one of these gluten free cheese muffins? Now that this excitement is over, let’s move to the muffins that have rocked my world! These muffins mix up in just one bowl….so easy. Also, a BIG thank you for all of the emails you have been sending me about these muffins!! 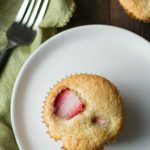 I love hearing how you adapt these muffins, and how much your family loves them! Use my recommended gluten free flour blend. Flour matters and not all flours contain gluten free grains that bake up light and fluffy. A bean flour based gluten free flour will not work. If you do use a different gluten free flour, make sure it contains xanthan gum. If it doesn’t, add 1 teaspoon. Do not over mix the muffin batter. The secret to light and fluffy muffins is to just mix the wet and dry ingredients enough to blend them. Over mixing will cause your muffins to be more dense. Muffin pan. This goes without saying…how else do you get those cute little handheld treats to look so good? Bob’s Red Mill 1 to 1 Flour Blend. This is the flour you need for light and fluffy muffins! 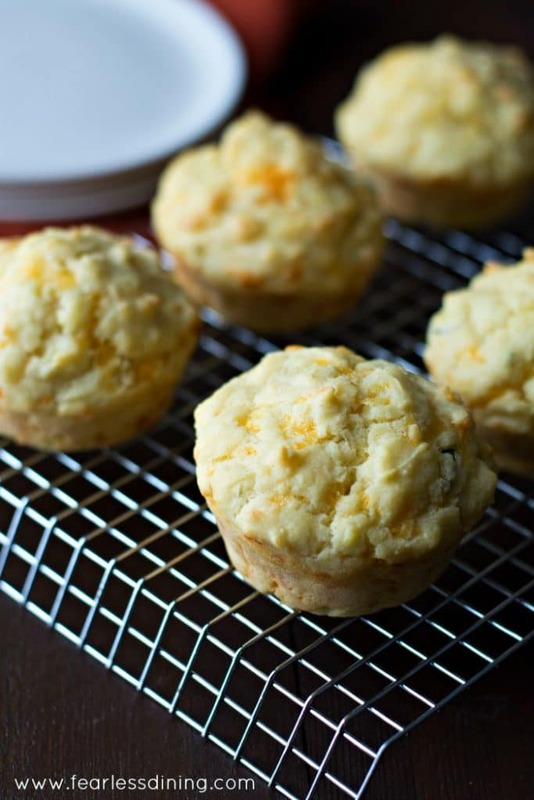 A gluten free cheddar muffin recipe that's easy to make, and the muffins are SO delicious! To see how to make the gluten free savoury muffins recipe, watch our RECIPE VIDEO! Spray olive oil into each cup of a muffin tin. In a mixer, add eggs, water and melted butter. Increase speed to medium for 30 seconds. Add baking powder, salt, flour, cheese and herbs. Scoop batter into each muffin tin so it is filled half way full. Bake for 18-20 minutes until done. Remove and put each muffin on a cooling rack. 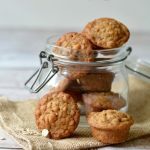 More Muffin Recipes to Try! Thank you so much for sharing.. Can’t wait to try. I live in Portugal, so I couldn’t find the flour you’ve used. The flour really makes a difference. The first time I’ve tried this recipe it didn’t work at all. They were far from fluffy. Today I tried a different flour blend and they were perfect! Thank you for sharing this recipe. 1. Keep ingredients to the side so the viewer’s line of vision is not obstructed. 2. Use a glass bowl for the Kitchen Aid mixer to avoid a “tinny” sound. 3. Pre-measutre all ingredients (as you already had done so for some) and put in small glass bowls or containers. Eggs, especially, should already be cracked into a small bowl to avoid a possible snafu with egg shells when cracked directly into the mixing bowl. 4. Keep a neutral background. Since you have a beautiful patterned countertop, a large wooden cutting board or other neutral covering for your counter would make the demonstration easier to view. I only offer these tips as you had stated you were going to try to do better. You are absolutely wonderful Virginia :-). I love your suggestions. I have been struggling with video, and finally decided to stay out of them myself and just focus on the food parts of the video. Thank you so much for taking the time to offer advice, I am very grateful. Hi Kathy, I am so sorry. I switched recipe plugins and this one needs the brand link to be manually entered. 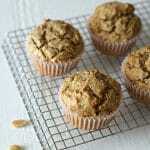 I am still updating, but please know I used Bob’s Red Mill 1 to 1 Gluten Free Flour Blend to make these muffins. Thanks so much for sharing these absolutely wonderful muffins in March Muffin Madness, Sandi! 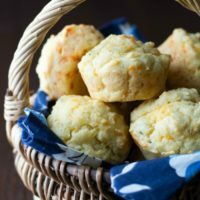 Cheese muffins by themselves are special indeed, but that little bit of rosemary added really makes a fantastic difference! I think you’ve just given everyone the answer for making all their meals better–especially those chili and soup meals! It might be spring, but winter temps are hanging on here, so soup and muffins are needed! Beautiful and smart. I forgot that muffins could be savory. Really I did. *lowers head* Thanks for a great looking recipe that I KNOW everyone will enjoy with dinner. I often forget as well. I think it is because my kids are always asking for sweet muffins 🙂 I appreciate your stopping by. I love savory muffins – these look great and I bet good with a bowl of chili! 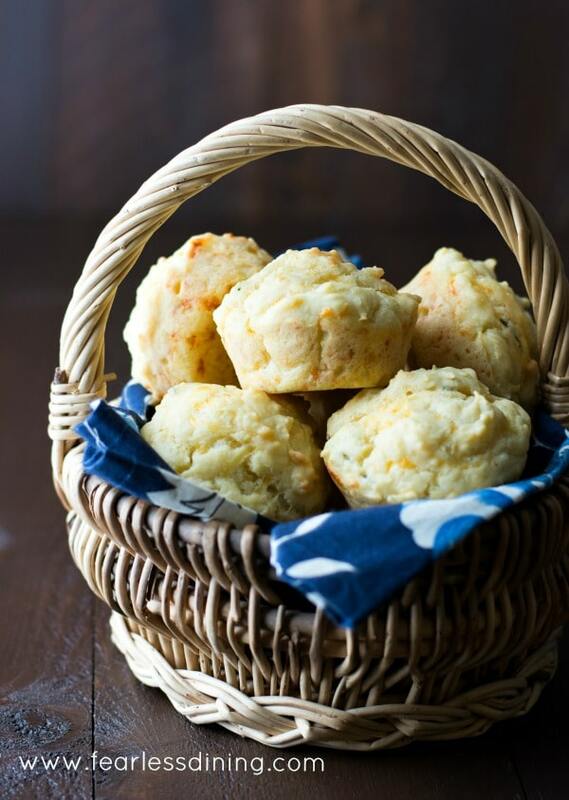 Cheddar herb muffins are my fave! I can’t wait to try this gluten free version. I love how super easy these look to make. And how delicious they sound. I must make these soon. I love breads with cheese in them! Your muffins look absolutely delicious, Sandi!! These look great! I love adding rosemary to baked goods, it’s one of my most favorite herbs! Look at you! Videos now! I love it, you’re a natural. *Blush… my hubby is pushing for me to make videos so people can see how easy gluten free baking really is. Thank you so much Michelle. I am learning more and more each day. These muffins look delicious! Pinning! These look fantastic! I love savory muffins! 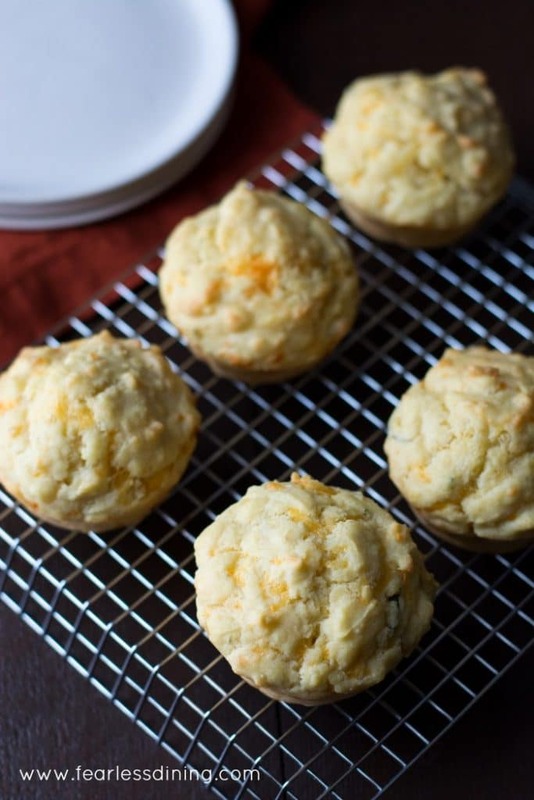 I CERTAINLY AM ANXIOUS TO GIVE THESE CHEDDAR HERB MUFFINS A TRY. I LOVE ANYTHING WITH CHEESE. Glad you’re participating in the MMM! Your recipes are amazing! Thank you Angela 🙂 I couldn’t wait either.